Winter’s end is looming again in the Wood River Valley. With fewer than 20 days left before the ski lifts close for the season, snow sports enthusiasts are cramming in as much time on the hill as they can and Sun Valley Co. has released a tentative schedule for closing up shop. Bald Mountain is scheduled to close Sunday, April 14. However, Sibbach said the Roundhouse restaurant will likely close Sunday, March 31. Seattle Ridge will likely remain open for skiing through Sunday, April 7, but the Seattle Ridge Lodge will begin a “limited food service” during the first week of April. Sibbach said the resort plans to continue food service at Lookout Lodge until the end of the season. He said “tacos on top” at Lookout, which the resort reopened this year as a taco bar, have become a very popular lunch for both local and visiting skiers. Sibbach said the River Run and Warm Springs base areas and lodges should remain open for both skiing and food service through closing day. “At least that’s our goal,” he said. Sibbach said Dollar Mountain is scheduled to close Sunday, March 31. He said Carol’s Dollar Mountain Lodge will remain open until Dollar closes for the season. 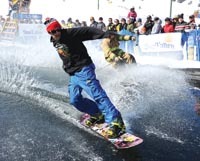 Sun Valley will host special events at Dollar Mountain on Sunday, including the popular pond-skimming competition. A time for the event has not yet been announced. Sibbach said the resort plans to close the Sun Valley Lodge for about a week starting Sunday, April 7, to extend the Lodge’s ceiling sprinkler system and to conduct minor maintenance and painting. The Sun Valley Lodge bowling alley has reopened following a broken water pipe incident that caused the resort to close the facility for repairs on Feb. 24. Sun Valley Co. spokesman Jack Sibbach said the resort opened the bowling alley again for business on Saturday. According to Sibbach, the bowling alley will offer extended hours this week as there are many families in town for spring break. He said the bowling alley will be open from 1-10 p.m. this week and, starting next week, from 4-10 p.m. as usual.